An iPhone 7 concept gets rid of the ugly antenna lines too. 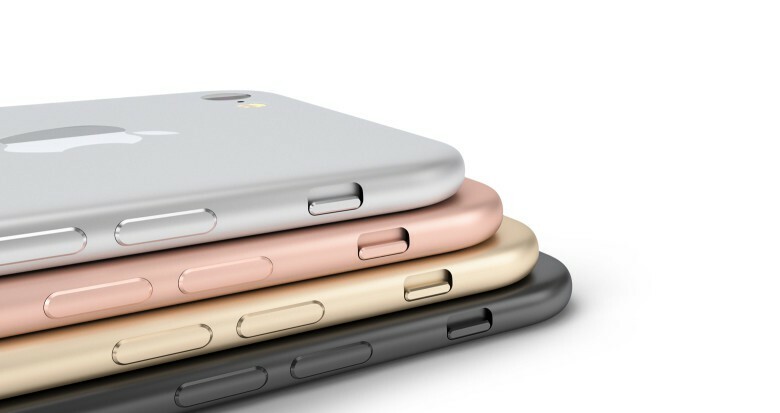 The upcoming iPhone 7 is almost certainly ditching the headphone jack at this point. What at first seemed like a ridiculous stretch is now shaping up to be the most credible rumor about the next-gen iPhone so far. The latest whispers indicate that, while the headphone jack is out, wireless charging and a waterproof design are finally in. 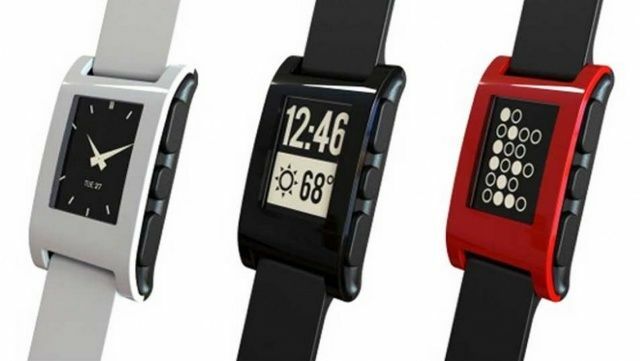 The creators of the incredibly popular Pebble smartwatch, which came alive in the midst of a Kickstarter campaign last year, said yesterday that they will be bringing “something special” to this year’s International CES in Las Vegas. Jefferies analyst Peter Misek is one of our favorite Apple analysts in the entire world. Mostly because his Apple predictions are usually horribly wrong. After the disastrous Apple TV SDK Event rumor he created earlier in the month, Misek is back with a new note to Apple investors, and it’s not a happy one. According to Misek, Apple is about to face a very rough two-year period, and he might actually be right. It's looking increasingly likely the iPad mini will get its own launch event in October. Take the back-of-the-envelope scribblings of a tech blogger with the appropriate degree of skepticism, but according to this breakdown of what the build-of-materials (BOM) cost of the upcoming iPad mini could be, Apple will sell their 7.85-inch tablet for $299 when it debuts later this year… and still make over $100 in profit on each unit sold. The new iPhone could be a little longer, a little thinner and a lot sexier. iLounge has had decent luck predicting new iOS devices recently, managing earlier this year to correctly prophesize most of the details about the new iPad (although consensus had pretty much agreed upon them already). 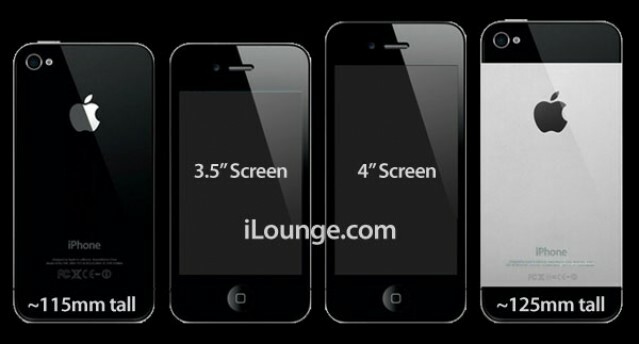 Now iLounge is doing the same for the iPhone 4S, and while they echo a lot of the current speculation about a thinner iPhone 5 with a longer 4-inch display, the professional renders iLounge has put together are absolutely top-notch. This would be an incredibly attractive iPhone. Well, eager readers, we’re just a couple short hours away from Apple’s iPad 3 event at the Yerba Buena Center for the Arts in San Francisco, and while nothing’s ever certain up until the moment Phil Schiller announces it, we’ve got a pretty good idea of what’s coming. The question is: do you care? 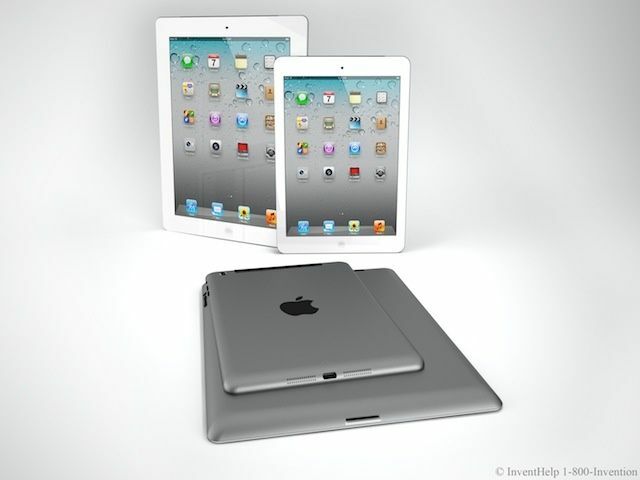 Are you excited about a new iPad 3, or a new Apple TV, or even a budget iPad 2? Or is your old iPad still working just fine, or do you think this is a bunch of hype all together? Let us know in our poll, then join us in the comments to tell us what you think Apple will announce and what you’re most excited about. We’ve got to kill time before the announcement somehow! 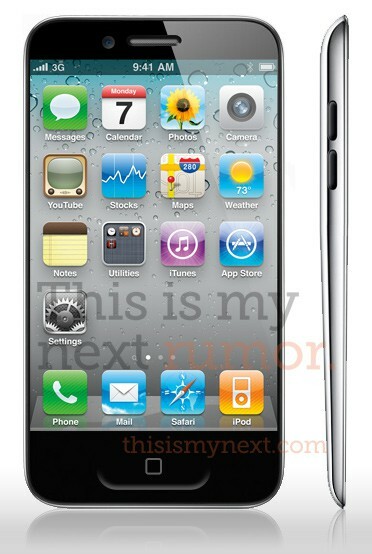 Rumor: iPhone 5 Gets Tapered Design, Larger Screen, Gesture-Sensitive Home Button? Apple may be prototyping an iPhone 5 with a tapered design, a larger 3.7-inch screen and a gesture-sensitive Home Button. This is according to the ex-Engadget crew at the new “This my Next” website, who whipped up the mockup above to illustrate the various rumors they’re hearing. New design: Apple is testing several prototypes (we all know this) and one of the leading candidates for the iPhone 5 is thinner than the current iPhone 4 and looks “more like the iPod touch.” It has a teardrop shape – thinner at the bottom than the top, like the new MacBook Air. Larger screen: the screen will go up to 3.7-inches, not 4-inches as rumored. It will keep the current resolution, dropping pixel density goes from 326 to 312, but will still be a Retina Display (it’s still above 300ppi). Global radio chips: It’ll be based on Qualcomm’s dual GSM/CDMA Gobi chipset, which means it’ll work on a ton of GSM and CDMA networks worldwide, most importantly in China. As Verizon’s systems get crushed with customers eager to buy an iPhone 4, Apple has hinted that the iPhone 5 will be coming to the carrier in July. Everyone knows that Apple will be refreshing the iPhone hardware this summer. But the big question about today’s Verizon launch is whether that carrier will get new hardware in less than six months. It seems likely. Apple is strongly rumored to be working on a dual-mode handset that works on both GSM and CDMA networks. But where does that leave VZW’s early adopters? How are they going to feel about buying a device made obsolete in a few months? 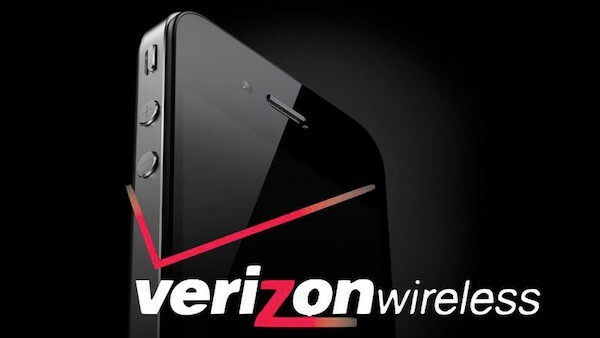 Apple won’t say if there will be an iPhone 5 for Verizon this summer. (“Let’s put it this way: We’re not stupid,” is all an Apple rep would say.) But if it does, and you buy an iPhone 4 now, you’ll be stuck with an outdated phone in only five months. To me, this reads like a tacit admission that the iPhone 5 will launch on Verizon and AT&T simultaneously this summer. Obviously Apple won’t pre-announce the iPhone 5 on VZW because no one that network will buy the iPhone 4 today. The picture above is burning up Digg right now. 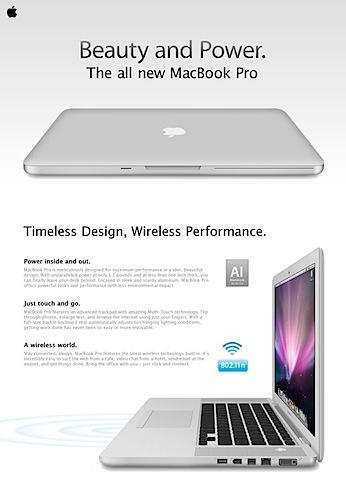 It supposedly shows the redesign of the MacBook Pro, which is expected to be refreshed any day now. The new machine looks gorgeous. With smooth, rounded contours, it resemble the MacBook Air, and there appears to be the magnetic hinge borrowed from entry-level MacBook, which would be a big improvement on the Pro’s current latch/hook design. Alas, it isn’t a leak — it’s a mockup from the MacRumors forums created by user mciarlo.